More and more people are becoming interested in mindfulness and how it can help them; it is even available on the NHS in some areas. Mindfulness helps people overcome anxiety, depression, addiction and more. Sessions are run 1-2-1, in small groups, in schools, in the workplace, in hospitals etc. 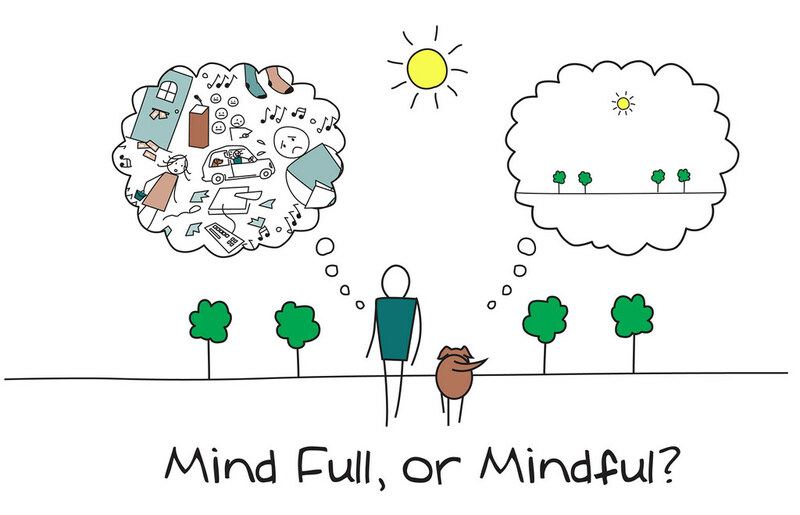 Mindfulness means ‘to be mindful’ or ‘being present in the here and now’. One of the reasons it is so powerful is that we all live in the future and past, most of the time, so worry about what might happen or has happened. Mindfulness brings you into the present and stops the distress. Many people stop at this point and use it as a kind of mental pause button. As nice as that can be, what happens when you release the pause button? Mindfulness is far more powerful than just a mental pause, it has the ability to retrain your mind and body and enable you to build personal resilience. When correctly taught, you will be able to use the mindful state of non-judgement that removes the emotional affects, and enables you to build more useful understanding and responses. It is human design that when you learn things correctly, you learn them mindfully by paying conscious attention. Unfortunately it is also human design that we accidently learn things unconsciously and therefore have no control over its impact. This can be corrected through mindfulness training. Mindfulness sessions will leave you relaxed and in control of your life. Here is a little more information on how mindfulness is used in Acceptance and Commitment Therapy. It tends to be more ‘bite-sized’ based on research that shows that even brief periods of regular mindfulness practice (5- 10 mins or just mini mindful moments!) can still be beneficial and help us to ‘rewire’ our brain. While many people think mindfulness means meditation, this is not the case. Mindfulness is a mental state of openness, awareness and focus, and meditation is just one way amongst hundreds of learning to cultivate this state. Acceptance and Commitment Therapy gets its name from its main themes - to accept things that are out of your control and commit to changing things that can be changed to make your life better. In summary, ACT uses mindfulness and acceptance skills to develop a more flexible relationship with your thoughts, feelings, memories and sensations. Time is also taken to clarify what gives your life meaning, your values. Without being held back by tricky thoughts and feelings and with a new sense of purpose and direction, you can begin to build a more enriched and meaningful life. The objective of ACT is not elimination of difficult feelings; rather, it is to be present with what life brings us and to "move toward valued behaviour“. To develop emotional /psychological resilience and flexibility through mindful practice. Mindfulness is awareness - primary thinking, not judgement thinking – secondary thinking. It is an attitude of openness and curiosity (non-judgement). It is a process of learning. It is the art of living consciously. Acceptance: Allowing unwanted private experiences (thoughts, feelings and urges) to come and go without struggling with them. Cognitive defusion: Learning methods to reduce the tendency to reify thoughts, images, emotions, and memories. The observing self: Accessing a transcendent sense of self, a continuity of consciousness which is unchanging. Committed action: Setting goals according to values and carrying them out responsibly, in the service of a meaningful life. Hypnotherapy is Selly Oak is helping so many people from students of Birmingham University to patients of the Queen Elizabeth Hospital and local residents alike. Selly Oak was originally named at the old oak tree that stood at the junction of the Bristol Road and Oak Tree Lane. This great oak still has a commemorative plaque at its new home in Selly Oak Park. The original Oak tree was felled in 1909 for safety reasons. Maybe you are interested in Hypnotherapy in Selly Oak because you would like to relax and build you confidence. Hypnotherapy can help overcome some many issues because few people realise that anxiety, phobias, stress and so much more is actually caused by a type of negative self-hypnosis and our job is to help you resolve this so that can again sleep peacefully. We are contacted regularly by people who, like you, are asking for help to overcome an eating disorder. Many people think that hypnotherapy NLP and CBT are only for people to lose weight but the truth is the wider area of eating disorders can and do benefit even more from these forms of therapeutic interventions. Anorexia Nervosa – the aim is to keep weight as low as possible by starvation and over-exercise. Bulimia - weight control by binge eating and then deliberately vomiting or using laxatives. Binge Eating – feels compelled to over eat. The TV seems to have picked up on another category and in typical media fashion, have given it the name ‘FREAKY EATERS’. Which is hardly a helpful label for the many people out there who are finding it extremely difficult to eat certain foods and/or food combinations. You may be amazed to find out that we receive calls on a virtual weekly basis, from both men and women, who can’t eat vegetables, or meat, or cheese, or carbs, or… well the list just goes on…. Our aim at the West Midlands Hypnotherapy Centre is to help you gain back the control so that you can choose much more freely what you want to eat. Rather than call it ‘an eating disorder’ how about you consider it as ‘disordered eating’ where eating habits have gotten out of order and the thoughts and beliefs surrounding certain foods is no longer of use to you. Your unconscious mind always does the best for you with the information it has but sometimes this information can get skewed and have a negative impact. If for a moment we consider the brain as a really powerful computer running programs all of the time then maybe the program it has been running around food has gotten corrupted or out-of-date so needs an updated. Your brain is a powerful tool but like all tools it needs to be maintained, this is where we can help. We will help you learn to relax and gain back the freedom to choose. Hypnotherapy in Solihull can help you find a hypnotherapist in Solihull. Many people in the local area want help but would rather it not be too close to home just in case your confidentiality is compromised when people notice you leaving a therapy centre on Solihull high street. Luckily we are close enough to help, yet far enough away to ensure your complete confidentiality with whatever we can help you to resolve. Solihull is one of the most prosperous towns in the Midlands and in 2013 was actually voted the best place to live in the United Kingdom by the uSwitch Quality of Life Index. Yet in spite of all this there has been an increase in residents of Solihull suffering from anxiety and stress. Some turn to smoking, drinking etc but many are finding it difficult to relax and even sleep. Luckily this is where we can make a difference by helping you to stop smoking and so much more. Compulsive hoarding (or pathological collecting) is a pattern of behavior that is characterized by the excessive acquisition and inability or unwillingness to discard large quantities of objects that would seemingly qualify as useless or without value. Compulsive hoarding behavior has been associated with health risks, impaired functioning, economic burden, and adverse effects on friends and family members. When clinically significant enough to impair functioning, hoarding can prevent typical uses of space so as to limit activities such as cooking, cleaning, moving through the house, and sleeping. It can also be dangerous if it puts the individual or others at risk for fire, falling, poor sanitation, and other health concerns. Compulsive hoarding in its worst forms can cause fires, unclean conditions (e.g. rat and cockroach infestations), and injuries from tripping on clutter, and other health and safety hazards. Kitchens that cannot be cooked in, refrigerators filled to the brim with rotting food, stovetops with combustibles such as junk mail as well as old food piled on top of burners. Filthy insanitary bathrooms; piles of human feces collected in areas of the home, sometimes there are animal feces over the floors of the home, giant bags of dirty nappies hoarded for many years. Some hoard scores of animals they cannot even marginally care for; often dead pets cannibalised by other pets are found under the heaps. Does not allow visitors such as family and friends, or repair and maintenance professionals because the clutter embarrasses them. Learn to organize the possession to decide what to discard. Our aim is to combine de-clutting and organisational skills with therapeutic intervention to enable you to not only take charge but to also ensure the problem does not re-occur.